A follow on to this question about extracting the signature image. Is it possible to just copy the plist file containing the signature from one Mac to another? Is there a recommended method for exporting and import signatures from one Mac to another I should follow instead? I could "sign" a blank PDF and take a screen shot of it but but I really want the same password to go along with the image so it's 100% the same signature on the other Mac as the one I'm using on this Mac. In Finder, click the Go menu and hold option to show the Library folder. Alternatively, press ⇧⌘G whilst Finder is active and enter the path above to directly navigate. On OS X Mavericks 10.9 and earlier, copy the com.apple.Preview.signatures.plist file. On OS X Yosemite 10.10 and later, copy the com.apple.PreviewLegacySignaturesConversion.plist file. Ensure the login keychain is selected and choose the Passwords category. On OS X Mavericks 10.9 and earlier, right-click the Preview Signature Privacy password and select Copy Password to Clipboard. This is the password used to encrypt the signature images. On OS X Yosemite 10.10 and later, right-click the Signature Annotation Privacy password and select Copy Password to Clipboard. Paste it into a text editor and save the file. You'll need to transfer this to your other computer(s). Launch Preview, open Preferences, and select the Signatures tab to ensure the default configuration files and folders have been created. Exit Preview. Ensure that the process is terminated. On OS X Mavericks 10.9 and earlier, copy the com.apple.Preview.signatures.plist file to the folder, overwriting any existing file. On OS X Yosemite 10.10 and later, copy the com.apple.PreviewLegacySignaturesConversion.plist file to the folder, overwriting any existing file. On OS X Mavericks 10.9 and earlier, locate the Preview Signature Privacy password in the login keychain and double-click to edit. On OS X Yosemite 10.10 and later, locate the Signature Annotation Privacy password in the login keychain and double-click to edit. Click the Show password checkbox and paste the password you copied from your original machine. On OS X Mavericks 10.9 and earlier, enter Preview Signature Privacy in the Keychain Item Name field. On OS X Yosemite 10.10 and later, enter Signature Annotation Privacy in the Keychain Item Name field. Enter Preview in the Account Name field. Paste the password copied from your original machine, per above procedure. I realise this is similar to scribbling on a sheet of paper and making a new signature in the destination Mac but if this is not to hand then this method has worked for me today. Hope it helps others. On Mac OS X High Sierra (Might be the case on Sierra as well, I can't recall) the signature itself is a base64 encoding of the image in the password field of Signature Annotation Privacy. Copy the account UUID and the content of the password field to your destination mac. 2. The file: com.apple.Preview.signatures.plist does not exist. 3. The Keychain Access entry: Preview Signature Privacy does not exist. Instead, use: Signature Annotation Privacy. Open your Preview app, and create a new signature which will later be replaced by your imported signature(s) from your source Mac. You can create multiple signatures here if you are planning to import multiple signatures from your source Mac. Quit Preview app. This should automatically create the missing Preview Signature Privacy or Signature Annotation Privacy keychain item(s) that you need to have in your Keychain Access. NOTE: If you are planning to migrate MULTIPLE signatures from your source Mac to your destination Mac(s), make sure to create a new signature for each signature that you plan to migrate. In other words, if you have 3 signatures you want to migrate, make sure you have created 3 Preview Signature Privacy or Signature Annotation Privacy keychain items in your Keychain Access. I had an issue on High Sierra where Preview would not save a new signature, and I was unable to restore signatures from another Mac. It turned out to be a corrupt Local Items keychain, which is where Preview stores the Signature Annotation Privacy password item. Since the Local Items keychain was not accepting new entries, Preview could not save new signatures. Solution: see this SO answer to resolve that problem. After doing that was able to add new keychain entries. Not the answer you're looking for? Browse other questions tagged preview signature . How can I use the “signature” function in Preview on Mac Mini with no camera? 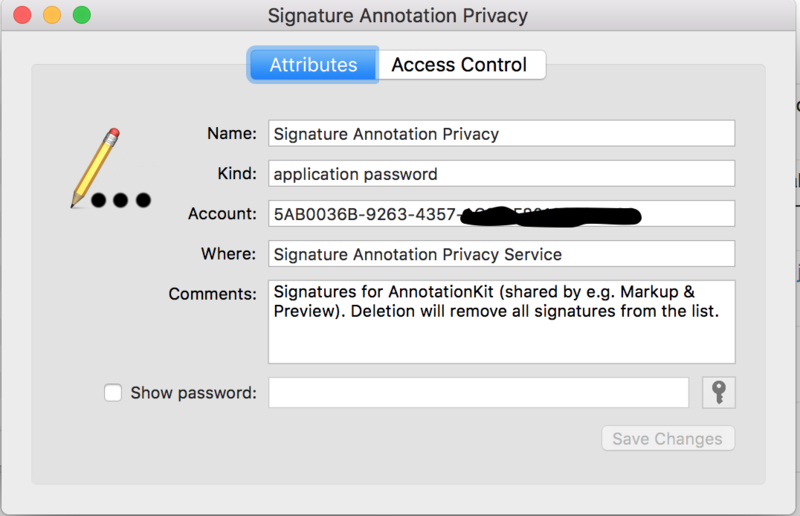 How to add signature to Preview on a Mac Mini? Can I import an image to use for annotations or a signature in the macOS Preview app?